For the past 10 years, homeowners and renters used our simple walking method to help measure their yard so they can find out how many linear feet they need to order. Now, that most of us have smartphones there is an easy and free app to help you measure your yard. Don’t want to use an app? You can easily measure without breaking out a ruler. Walk the perimeter of the area you want to enclose, counting your steps the whole way. Multiple your total steps by 2 ½ and that’s the amount of linear feet you need. In suburban areas, coyotes can lose their fear of humans because of the abundant food resources provided. Unfortunately, their food supply may include family pets. Household garbage, dog food, and available water from ponds and landscape are also to blame. Intentional feeding of coyotes by residents is another problem. What should you do if you encounter a coyote? Most people know that dogs need to run free and play off-leash to keep them healthy and happy. This is true with small breed dogs as well as larger dogs. A popular solution today is a wireless dog fence also known as an invisible underground electric dog fence. On the surface an underground fence may seem like a great solution. It’s cheaper than a traditional wood, vinyl or chain link fence and since it’s underground you can’t see it at all. However, the cost, training requirements and rate of failure are rarely discussed. Let’s take a look at the cost first. What’s the cost of an underground invisible electric dog fence? If you have a large strong dog, or if you have multiple dogs that are different sizes, you will want to have more correction levels available in order to custom-design the corrections for your dog. If you have a 60 pound lab and a 20 pound pug, you’ll need a system that can work for both dogs and those systems are more costly. However, these are not the only costs involved. Now that we know how much invisible fences cost, let’s look at how effective they are. Studies show that wireless dog fences fail for roughly 30% of dogs. Why do invisible fences fail? The initial shock may not be enough to stop your dog from leaving your yard. You may need to increase the level of shock (or correction) that you need so your dog pays attention to it and stops leaving its boundary. In the video below you’ll see a dog that has been trained with an invisible fence, but a cat was enough of a reward for him to run right through the invisible barrier – all while being shocked. Your system only works if the batteries in the collar are working. Many times dogs will escape their boundary simply because batteries have not been replaced in the collar. Your wire may have a break. Some brands don’t have an audio alarm on their transmitter. Instead, the transmitter just blinks – so you would never know if you have a break in your wire unless you physically check the transmitter – which for many people will be in your garage. This is so common that many of the large brands, like PetSafe, sell repair kits so you can find the break in the wire and fix it. However, these Wire Break Locator repair kits only help if you have a complete break – not a partial break. For that, you’ll most likely need to call a professional or reinstall it yourself again. Because you are dealing with electricity, there are hundreds of small issues that can pop up and cause your fence to fail – but one of the largest issues is a lack of professional training. A shock on a large dog may not be strong enough to disway him or her from running through their invisible barrier. Nearly a quarter of our customers tell us that they tried an invisible electric fence, mostly due to price but had to look at other options since it kept failing. Not to mention all the ethical and behavioral concerns many dog trainers and veterinarians have with shock collars. Traditional fences are far too expensive and won’t stop your dog from digging under your fence, or climbing over your fence. For the same price (or less) of an installed invisible dog fence and training which fails 30% of the time, you can get a DIY Dog Fence Kit that works 98% of the time and be confident that your dog will be safe, happy and healthy in your backyard. One of the most frustrating things to deal with as a new dog parent is an escape artist dog. Many dogs are rehomed or end up in shelters because their families can’t stop them from digging under or climbing over their fence. Depending on your breed your dog may be digging for a variety of reasons. Terriers, for example, are hard-wired to dig and search out prey. Your terrier doesn’t have to be a big dog to cause a problem. Terriers that are only 20-25 pounds are super athletes and can easily jump over a standard 4 foot tall chain link fence – in addition to digging under your fence. We recommend a 6 foot tall dog fence. So, how do you stop your dog from digging under your fence? The most effective way to stop a dog from digging under your fence is to physically prevent your dog from doing it. This is what certified dog trainers call “management”. There are lots of long-term training methods that you can do as well, but that won’t stop your dog from escaping from your yard tomorrow or next week – or even next month. One you’ve physically prevented your dog from digging under your fence, how do you start changing your dog’s behavior? Dogs dig for many different reasons. They might be bored or they might be seeking out prey, which is their natural instinct. Trying to figure out why your dog is digging may take several weeks to fully comprehend. Start by trying to meet all your dog’s needs for exercise and mental stimulation. If you’re leaving your dog outside by himself all day long, how will he occupy his time? Sometimes you can reduce boredom issues by getting your dog a friend. However it’s critical that you make sure that your dog will actually engage and play with your new dog until they are both tired. A tired well-exercised dog is a lot less likely to dig. If adopting another dog is not a solution, and you can’t seem to provide your dog with the mental stimulation or physical exercise he or she needs, consider buying puzzle feeders. These provide mental stimulation to your dog to prevent boredom, which many times is the root cause why your dog is digging under your fence. Some pet parents, especially first time dog owners, think that they may want to have puppies. Whether to keep for themselves, or to sell. So, they opt not to spay or neuter their pup. However, a dog in heat can be almost impossible to train unless you can dedicate 2-4 hours a day to training your dog. A fully intact male dog may aggressively pursue prey or sexual partners. Whether you have a male or a female dog, we highly recommend that you spay or neuter your dog if you want to stop your dog from digging under your fence. Rocky yard, Sloped yard and Boulders Oh My! Do you have a rocky yard? A sloped yard? Have you been given an incredibly expensive quote from a traditional wood or chain link fencing company? Leveling an entire yard would be expensive, impractical and time consuming. Our Dog Fence solves all these issues. Our featured testimonial is from Sandy, a foster pet parent from Connecticut Pet Rescue. She shows how our fence can be installed with a difficult back yard. If you don’t want to watch the whole thing you can jump to these important clips with the links below. Sandy also tells the story of how her invisible underground dog fence, worked for 3 years for her dog Tazy, but stopped working when Tazy learned that all she had to do was run through a 5 second shock to play with other dogs. Small dogs are awesome. Most of the time they are easier to care for and groomers charge less to cut their nails too. However, even small dogs need exercise. Your high energy small dog will inevitably get into trouble if their physical exercise needs are not met. They will become bored and will use their pent-up energy to chew holes in your favorite shoes or dig escape routes under your fence in the backyard. Yes, even small dogs need to be prevented from accidentally leaving your yard and getting hurt. Pet Playgrounds offers 4 foot tall dog fence kits with anti-climb and anti-dig features that are perfect for your small dog. These dogs need enough to run around and play off-leash. Some dogs are so small that they don’t just need a fence to prevent them from leaving your yard, but they need a fence to prevent them from accidentally hurting themselves. Our fence is so flexible that innovative solutions can be used to help virtually any situation just like this one. In this case, the customer was worried that her older Chihuahua would fall through the iron rails and hurt herself on the concrete below. So, we provided the customer with a easy solution with materials she had left over. She used the same polypropylene mesh that is used on the top of the fencing system to create a barrier. She hog-ringed the material to itself and attached it to the existing iron rail fence using off-the-shelf twist ties. Voilà! Her small dog problem has been solved. This is just one example of how pet parents can use our materials solve unique situations. Our 4 foot tall dog fences are $6.50 per linear foot and our 4 foot tall dog fence gates are $180. (Our standard gates are 5 feet wide to let most commercial lawn mowers through), So, for a small dog that is not classified as “high energy”, you you can purchase a 100 linear foot dog fence kit with 1 gate for just $830 and give your dog the freedom to run free quite affordably. A 200 foot kit gives your dog 4x more room as a 100 foot kit. For high energy small dog breeds, we recommend 200 linear feet of space because these dogs needs lots of space to run and play. When you upgrade from a 100 foot kit to a 200 foot you actually quadruple the amount of space you are giving your dog to run free. While you may think you are just doubling the amount, you are giving your dog 4x the amount of space to run. Here are the small dog breeds that require 200 linear feet or more. Based on their individual behavior and your surroundings you may want to choose a 5 foot or a 6 foot tall fence to keep predators out. How much fence do I need for my dog? This is a question we are asked almost every day. For most breeds we recommend a 5 foot tall fence and a minimum of 200 linear feet of fencing. While we offer kits as small as 100 linear feet, these were designed primarily to be used as expansion kits for existing customers and for smaller dogs (like a shih tzu). A small 100 foot dog fence kit does not provide enough area for most dogs to run and play, and therefore your dog will constantly try to dig, climb and chew his or her way out of the small enclosure. This concept is difficult to understand, but here is a diagram to help you visualize the exponential difference in space you can give your dog when you purchase 200 linear feet instead of a 100 linear foot kit. As you can see with the diagram, you can give your dog up to 2,500 square feet of play area vs. 625 square feet when you purchase a 200 linear foot kit. While you might think you are only doubling the amount of space by increasing your kit to 200 linear feet, you are in fact quadrupling the size of your play area. Why do dogs try to escape in the first place? Dogs don’t like being restricted – whether it’s a physical or invisible barrier, so we’ve designed our kit to prevent your dog from climbing, digging and chewing their way out of their Pet Playgrounds dog fence. However, no enclosure is 100% dog proof, and if any manufacturer tells you their product is – they are lying. We have succeeded in the dog fencing industry for 10 years, by being honest, 100% transparent with our pricing, and by providing small, medium and large dog parents the most affordable and REAL physical dog fencing system in the world. Boredom is a major reason. Your dog’s breed or individual behavior may require a lot of exercise. Walking your dog twice a day or even going to the dog park once a week is not enough activity for many breeds. Dogs need to be off-leash to run and play naturally. While our 100 foot kit will most likely prevent your dog from escaping, your dog won’t be very happy. If you own a large breeding, working, or herding dog they require much more space than a 100 foot kit can provide. We understand that not everyone has a spacious yard or the ability to provide a large dog with ample exercise, but choosing enough space is important to keep your dog safe, secure and happy. How do I measure and order? Walk the perimeter of your proposed enclosure and count your steps, then multiply your steps by 2.5 – it’s that easy. You do not need to wait for an installer to come to your house and measure – that’s partly how we keep our fencing system so affordable. Still have questions? Take a look at our frequently asked question section or call us at 1-800-985-9202. Most fencing companies have arbitrary pricing schemes based on many different situations and regions. We don’t. 1st step: A homeowner (or renter) measures how many linear feet they would like to order. This is done by simply walking the perimeter of your yard and counting your steps as you walk. Then you just multiply the total number of steps by 2.5. This process is thoroughly explained in our short video, which you can watch by going to petplaygrounds.com/measure. Measuring how many linear feet you need is easy and only takes a few minutes. Some people may think that they need a professional to come to their house and measure how many linear feet they need or to help make decisions on your layout – but that is simply not the case. Traditional fencing companies require a professional to visit your house because their systems are not flexible like our dog fencing system. With our dog fence your layout does not need to be straight. Your land does not need to be level. There are no extra charges for our materials or optional professional installation based on the conditions of your yard. Our dog fencing system has been designed to be installed by virtually anyone and virtually everywhere. Our fencing posts do not need to be in a straight line, and the fence does not require your yard to be level. Because of this, a professional is not required to measure your yard. You can simply dictate wherever you want your fence. By asking homeowners to measure their yard, we are able to save roughly $450 on every dog fence kit that is ordered. Every penny is passed on to you. 2nd step: Once you have measured your yard, you’ll go to petplaygrounds.com/order to place your dog fence order. You’ll simply choose the height and click continue. Then you’ll choose how many linear feet you want and then you’ll click continue. 95% of our customers order a gate. You have 3 different widths to choose from (5 feet, 8 feet and 14 feet). 5 feet is the most popular as it is the most affordable. It’s also large enough to allow most riding mowers to go through. Other options: 98% of our orders are standard layout orders, which means that the advanced options that we offer in our ordering process such as extra post corner kits, or the upgrade to a MAX strength system can be skipped by most dog parents. As long as you are using your house to complete on side of your enclosure, then you can skip those advanced options completely. If you don’t understand what post corner kits are or whatwhat we mean by “using one side of your fence”, don’t worry. Once you watch the video at petplaygrounds.com/measure you’ll understand exactly we mean. Words can not easily describe what a short video can show in just a minute. Tired of looking at your damaged wood, chain link or vinyl fence? Traditional fences can take thousands of dollars to fix. Husband and Wife install 900 linear feet in rocky Colorado. A husband and wife purchased our DIY dog fence kit and installed 900 linear feet of fencing on their rocky uneven Colorado land for their 2 awesome dogs. Here’s a video of their experience installing the fencing system. This is a great way to see if you’d like to install your own fence or if you’d like a professional to install it instead. Thank you for your service – Independence Day Sales. To all the military families out there: Thank you for your service. Pet Playgrounds is offering a 10% coupon on any dog fence kit over 200 feet for for military families. This customer has 5 dogs, and 2 of them were escape artists – always digging and chewing their way out of the backyard. They chose a 600 linear foot MAX strength dog fence kit with professional installation to keep their dogs in their yard. creates our MAX STRENGTH dog fence kit. Watch these two diggers and chewers enjoy their MAX Strength fence! If your dog is a constant chewer, consider purchasing a MAX strength kit. You can choose this option in the 3rd step of our Build Your Kit tool . Our MAX strength kit is 6 feet tall and is $10 per linear foot. One of our most common questions is “How much will it cost?”. We believe in complete transparency in our pricing and that’s why we created a tool where you can see the exact price of your kit and optional installation services. Our prices are based on height and length. In the first step you’ll choose your height. In the second step you’ll select the length. Our kits start at 100 linear feet and come in 50 foot increments. You’ll notice as you use the slider the pricing and options you have selected will update in real time. You can see so far that we’ve selected a 6 foot tall / 250 linear foot kit. Once you click the green button, you’ll reach the next step where you can choose your gates (if you want any), and extra post corner kits (which is uncommon), or if you want to convert your kit to a MAX strength kit. Unlike other fencing companies that try and charge you a price they deem appropriate which can vary wildly from person to person, we provide everyone the exact same pricing. Our system is so flexible that we are able to do this. Whether your property is rocky, hilly, or even swampy our solution will be assembled the same way. Don't want to install your kit yourself? No problem! You can request a professional installer to install your kit during checkout. Start by using our Build Your Kit tool. Help Celebrate our 9th Anniversary by Saving a Life. Pet Playgrounds has partnered with the The Gould Insurance Group based in Connecticut to help save lives. It’s easy to help. Simply request a quote for your home and/or auto and they will donate $10 to your rescue organization of choice! It’s never been easier to help save a life. This offer is available to any homeowner in the following states: Maine, New Hampshire, Vermont, Rhode Island and Connecticut. Call HR Angelico, Jr of The Gould Insurance Group at 203-706-4017 or fill out the form below to help save a life. Don’t live in the north east? That’s fine! Just forward this offer to your friends and family that live in any of the qualified states or post this link on Facebook or Twitter. What is a corner post? A corner post should be used on a 90 degree corner to join two lines of fence. Corner posts can be used for odd angles where the angle is closer is between 45 and 90 degrees. An angle of 45 degrees may require a corner post, depending the tension of the cable. Additionally, If you do not want to attach our kit to your house and are creating a free standing enclosure you’ll need to add 2 extra post corner kits to assemble your kit. The video describes this process as this is the most common use for corner posts. The principle of bracing a corner post is simple. Do to leverage, the greatest tension on the post is along the horizontal wire furthest from the ground. Using a brace kit we are able to transfer that tension back to the base of the post at ground level. That is what allows the post to resist the fence’s tension. Congratulations to Michael and his pal Jodi on winning our iFetch Too contest! We can’t wait to see pics of Jodi playing in her Pet Playgrounds fence and her new toy! Where the Love Is, Inc. is animal rescue group based in Hamden, CT who uses our Pet Playgrounds dog fence system. We’ve upgraded our dog fence! Pet Playgrounds is continually researching, and reengineering our kits to be easier to install, and to perform better. We’ve upgraded one of our main components of our dog fence kit. Our fence is made up of 2 core materials, our 1000+ pound break strength polypropylene mesh and our NEW 1800+ pound break strength rubber coated welded wire. This new material has replaced the older 18 gauge metal hex wire that we used to use to form our dig & chew guard. Watch our video to learn more. Are you a renter or a homeowner looking to move soon? Great! Pet Playgrounds has an affordable physical dog fence system that you can take with you when you move. Our fence is perfect for renters, homeowners in a HOA (Home Owners Associations) and anyone else that needs to move or modify their fence. Why? Our can fence can be installed virtually anywhere, by almost anyone. Our fence is nearly invisible. Stepping back just 10 feet makes our fence virtually disappear. Our fence is the most affordable dog fencing option when compared to other physical fencing materials like wood, aluminum, composite, vinyl or chain link. Watch our FULL installation video to learn more. You can skip to the section How to Take the Fence with You to see how easy our fence is to move. Pet Playgrounds engineers, manufacturers, distributes, and installs the safest and most reliable REAL dog fencing system in the world. From a small office in West Haven, Connecticut Pet Playgrounds has now grown nearly five times since 2010. Although 2016 is not yet done, Pet Playgrounds has made some incredible advancements this year, already. First, Pet Playgrounds now has installers available in all contiguous 48 states. By partnering with local certified professional installers, Pet Playgrounds has been able to focus installing in its local territory (Connecticut, Massachusetts, and parts of New York, New Jersey, and Pennsylvania), continually making the installation process easier and less expensive. Recently, Pet Playgrounds launched an updated website available at http://www.petplaygrounds.com making it easier than ever for customers to learn about their unique dog fencing system. Customers can now order a kit up to 1,000 linear feet online and getting an instant installation quote in mere seconds. The last 3 months have been spent reshooting all new video tutorials, designing a custom “Build Your Kit” tool, and incredible step by step video instructions making installation a breeze for any homeowner. How did it all start? Victor Boemmels, the inventor and President of Pet Playgrounds has had a love of dogs from a very young age. Victor had his first puppy when he was nine, and he became a dog lover instantly. Unfortunately, his new puppy had escaped from his family home and was hit and killed by a car. It was devastating to him but it inspired him to dabble in various training techniques for dogs. He became an amateur dog trainer and became so good at training his dog, Goya that others started asking him to help train their pups. Victor saw how many close calls many of his friends & family had with their dogs escaping their yard and getting hurt. This was the inspiration to engineer an affordable yet incredibly effective dog-specific fence. Since then, Pet Playgrounds has become the only dog fencing system in the world that has been tested and approved by PETA. The unique fencing system received several endorsements from veterinarians and certified dog trainers due to its humane alternative to ineffective invisible electrical fencing that relies on shocking your dog to keep it safe. Using some of the latest web technology Pet Playgrounds has developed an incredibly easy to use website, with multimedia elements such as videos and even a virtual tour that allows customers to investigate certain parts of the fence to get a better view of how it is assembled. What’s next for Pet Playgrounds? Quite a bit. We are currently sourcing 360° cameras to provide customers a way to see how dogs interact with our fencing system. Our goal is to make our website the best way for customers to see exactly how our fencing system works. We’ve also upgraded the strength of one of our major components and have already shipping this components to all new customers. How strong is our fence? Our fence is comprised of 12 unique components. One of the most important components that is included in every kit is our 1,000 break strength polypropylene mesh. This material is incredibly flexible yet incredibly strong. It is a unique material that no other competitor provides. Why? Because our competitors choose to provide lower quality 400 pound break strength polypropylene mesh that won’t hold up over time. Frankly, our competitors are repurposing cheap garden fencing materials to contain your dog. That’s not what we do. It’s not safe, and it won’t contain your dog. So exactly, how strong is our fence? What you are seeing here is a tree that has fallen down on a Pet Playgrounds fence installation which happened after a hurricane. As you can see, all that needs to be done is to get the tree off of the fence and your fence is back up and working. No other fence – whether it is wood, vinyl, aluminum, composite or chain link could stand up to a tree falling on it. You would have to replace an entire section and most likely fix posts, fix the railing and it could potentially cost you thousands. That’s how strong a Pet Playgrounds non-electric dog fence is – and we think you’ll love it! To shock or not to shock your dog. That is the question. Dogs can feel like they are being punished (by shock) when they run up and greet someone who is past the perimeter of the fence. That new association can quickly lead them to believe that everything should be feared and nothing is safe. Then the aggressive issues expand to other areas beyond the yard and invisible fence. Invisible wireless electric fences do not stop other critters from coming in your property. So if you live in an area where coyotes are common you can endanger your dog, because essentially your dog becomes a sitting duck because you allow other animals to freely enter your property while your dog is restricted. Invisible wireless electric fences require an adequate training process. If you just install a dog fence, slap the collar (receiver) on your dog, and then stick him in the yard to figure it out on his own, at best you’ll confuse your dog and at worst you’ll flat-out frighten him. If you want to create an area where your dog can run free without having to spend a lot of time training your dog you should look into a non-electric dog fence kit where there is no training required. Dogs can try to test their boundaries but they simply won’t succeed in escaping. If your dog already has a significant health problem an invisible wireless electric fence might critically harm your dog, especially if you have the level of the collar turned up high. The problem is at low levels the shock is too low that a dog would not notice it when wildlife or another dog runs by because they are too distracted. If your dog is younger than 6 months old most veterinarians will tell you to wait before you you can install an invisible wireless electric fence, which means either your pup has to be leashed when he or she is outside, or can not really go outside until it is older. With a non-electric dog fence kit you do not have any age restrictions. So there you have it. Interested in why so many customers choose our non-electric dog fence? Find out why. We are the sponsor for Our Dog Show! Check out the podcast! Thank you for watching the VIDEO version of the 4th Episode of Our Dog Show (www.ourdogshow.com). Our big story today is all about Xylitol, a sweetener in some sugarless foods that can make your dog incredibly sick, or even kill your dog. Learn more about Xylitol with expertise provided by The Pet Poison Helpline. Our Dog Show is sponsored by Pet Playgrounds, makers of the safest and most reliableREAL dog fencing system in the world. Visit them at www.petplaygrounds.com and use code OURDOGSHOW to save 10% on any dog fence kit. Welcome to the VIDEO version of the 3rd episode of Our Dog Show. In this episode special guests, Stephanie Williams and Fran Zelladonis, certified dog trainers and owners of Pawsitive Partners answer questions. Our Pet Playgrounds dog fencing system is so flexible that it can be used in a variety of ways. This customer already had a decorative fence but it wouldn’t keep her beagle mix in the yard, so we installed a Pet Playgrounds non-electric dog fence kit and left her decorative fence completely in place! In another installation we had a customer that had a decorative iron railing system but it didn’t wrap around his entire property. So we took care of finishing enclosing his property for him. We highlighted our fence here so you can actually see it. It really is nearly invisible. Have a rock wall? Not a problem! Our fence can be installed without removing your beautiful rock wall. It’s so flexible it can installed virtually anywhere. These are just some of the ways you can install your Pet Playgrounds dog fence kit, or one of our professional installers could do it for you! Call us at 1-800-985-9202 for more information, or start shopping now! Listen to Victor Boemmels talk to Hal & Judy on this Animal Radio Clip. Find more information at http://www.petplaygrounds.com and use coupon code ANIMALRADIO to save 5% on your entire dog fencing system. The importance of fencing to your pet’s safety cannot be underestimated. There is a good reason that most shelters, rescue organizations and responsible breeders require that you have fencing in place before approving an adoption. A fully fenced yard keeps your pet off the road and away from the risk of being hit by a car. Small breeds are unlikely to jump a fence that is four feet or more tall but athletic, medium to large sized dogs an easily jump four feet and are better off with a fence that is six feet tall. However, jumping is not the only escape risk. Many dogs are avid diggers and can easily dig under a fence. So what fence is right for you? Invisible Fencing. While invisible fencing will keep some dogs contained, many determined breeds will run through the electric shock. This is most likely to occur if your pet is intrigued by a wild animal or another dog. Below, you can see just one Twitter post, but dogs running while they are being shocked is a very common problem . It also does not stop other dogs or predators from entering your yard. This means that another animal can enter your property and harm your pet (like coyotes sometimes do). Chain Link Fences. Chain link fences are popular because they are cheaper than wood, vinyl, and aluminum fencing but they are not as effective as a Pet Playgrounds Dog Fence. Dogs can use the stiff chain link metal fence just like a ladder, and simply climb right over your fence! Your dog doesn’t even have to be a large or tall dog as you can see in the video below. In fact, chain link fences are like ladders to dogs. They actually help your dog escape. Wood Fences. Many people think a decorative cedar wood fence can contain their dog, but unfortunately wood fences simply don’t work either. In addition to climbing a fence, dogs tend to dig under a fence as you can see in the video below. Wood fences also are very hard to maintain. If your wooden fence happens to be hit by a hurricane you will likely have to replace a large section of your fence. A Pet Playgrounds fence is the best dog fencing system that you can get for your dog. To prevent dogs from climbing over the fence we use a 1000 pound break strength polypropylene mesh which is incredibly strong, yet very flexible. This means that dogs can’t get a grip and climb over the fence like they can with chain link fences. It feels like a net to a dog and other animals. This material is also incredibly strong. If you take a look at the video below, you’ll notice that a tree fell on one of our fences after a hurricane. We simply cut the tree to push it off the fence, and connected back the material with a hog ringer (a simple hand tool that we provide in our kits). The whole process took about 20 minutes. If this had been a wood or chain link fence you would have no other option but to replace an entire section. Secondly, we use an 1800+ pound galvanized rubber coated welded wire netting material that doesn’t stop at the bottom. In fact it continues about 6 inches, towards you – like a backwards “L”, like this shape: ⅃. Although it is not the only component that creates your dig guard to prevent your dogs from digging under, it is the most critical component to keep a digging dog secure on your property. We then use special zig-zag shaped ground stakes to keep the steel welded wire netting material bonded to the ground. Together, our system is comprised of 12 components that can easily be installed by the average homeowner, or a professional installer. What dog owners need to know about the dog flu outbreak. 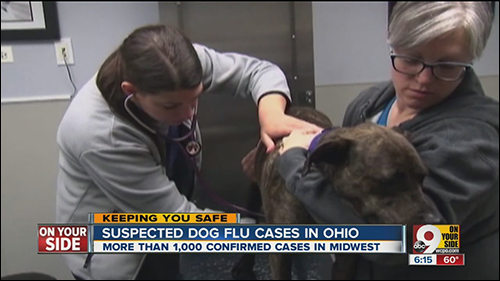 A canine flu outbreak (H3N2) has sickened many dogs in the Midwest, and veterinarians are cautioning pet owners to keep their dogs from going nose-to-nose with other pets to stop it from spreading further. Both viruses can cause persistent cough, runny nose and fever in dogs. Experts say a small percentage will develop more severe symptoms. The H3N2 infection has been associated with some deaths. Positive tests for H3N2 have also been reported in Alabama, California, Texas, Massachusetts, New York, Wisconsin, Michigan, New Jersey, Iowa and Indiana, according to the most recent report by Cornell University’s Animal Health Diagnostic Center. And a new case was confirmed Wednesday in the metro Atlanta area of Georgia. It’s estimated that several thousand dogs have been affected by the virus, but not more than 10,000 at this point. The mortality rate is about 2-3%. Dog owners need to have increased vigilance to avoid dogs that appear sick and to not take their dogs to public places if they are sick. Avoid taking your dog to dog parks or to doggy day care facilities if you are in the affected areas. Dogs are most infectious before symptoms are apparent, and can continue shedding the virus for around 10 days. This means that by the time symptoms are seen, other dogs may have already been exposed. Luckily, Pet Playgrounds offers dog fence kits that can act as your personal dog park right in your own backyard. Just how strong is our dog fence? Just how strong is a Pet Playgrounds dog fencing system? This video should clear a few things up. Pit bulls (in particular) should have a large, well fenced yard for daily exercise. A fence that is able to contain your large and energetic pit bull is absolutely necessary to protect your dog, the breed, and the neighborhood. You don’t have to be a rocket scientist to contain a dog and yet so many people fail to, resulting in “incidents” which harm the breed. There is NO excuse for allowing a bulldog to run loose in the neighborhood. We recommend a 6 foot tall fence with at least 200 feet of room for any large dog. This will give you about a 2,500 sq. foot personal dog park. Our unique fencing materials makes it very uncomfortable for a dog to spend too much time against the fence. This increases the level of protection our fence provides. Every Pet Playgrounds dog fence comes with REAL chew, climb, and dig protection. Our hybrid dog fence is strong and flexible. It’s so strong it can even stand up to a tree falling on it during a hurricane. Its flexibility is what makes climbing our fence virtually impossible from either side. The fence feels like a net that dogs and other animals simply can’t climb. Our hybrid fences do not have a top rail, instead there is a 12 gauge black vinyl coated, UV protected, braided STEEL cable that keeps the fence tight and straight. Need financing? Make no payments for 6 months! Pet Playgrounds is THE best way to let your dog run free, and we recently added a Cat Conversion Kit so you can now keep your cats and your dogs on your property. We are the most affordable and effective dog fencing solution. Still have questions? Call us at 1-800-985-9202 anytime and one of our Pet Fence Experts will help you choose the best kit to contain your dog or cat. Pet Playgrounds offers REAL climb, dig, and chew protection for any breed. It is nearly invisible. Stepping back just 10-15 feet makes the fence virtually disappear. It’s the most affordable fencing option to protect your dog. It can be installed virtually anywhere – by anyone, on any terrain even over rocks, tree roots, and uneven land. Unlike wireless electric fences that might harm your dog, Pet Playgrounds fences keep other critters out as well as ensuring that your dog does not runaway. All materials last for 15-20 years and are virtually maintenance free. Our non-electric dog fence kit has been field tested by PETA, and they loved it! We know you and your dogs will too! For people with yards that are difficult to fence — such as a yard that is bordered by a stream, full of rocks, or on uneven land – a wireless electrical invisible fence is an option that many dog owners consider. So how do these systems work? A wire is installed underground for the entire enclosure. This wire has a radio signal and the dog wears a shock collar. If the dog gets too close to the wire or attempts to cross the boundary, the dog receives a shock. This “shock treatment” trains the animal to stay within its appointed area. Dog trainer Pamela Dennison says this about the shock that your dog has to receive in order to understand that they are not supposed to cross an imaginary line. Now, not everyone agrees that shocking your dog is inhumane, but this is not the only issue. Unless you’re going to put collars on every critter that exists in your neighborhood, an invisible fence does nothing about keeping other dogs, coyotes, and other predators OUT of your yard. Strays and/or feral animals can come in and do whatever damage they wish to your dog and he is pretty much helpless to get away. Another issue is that dog owners that purchase this type of system rarely provide their dog with the special training necessarily to get used to the invisible fence system. This means that a dog is not just shocked once or twice, but is continually shocked which can cause all sorts of physical and neurotic problems. Dogs may associate the pain from the shock with the environment or with objects in the environment (including humans, dogs, or cats), rather than with their escaping the property line. This may lead to anxiety or negative associations with those objects, which can ultimately result in aggression. Some dogs that have been conditioned in this manner, may not want to set foot in the yard, for worry of pain. They may also start to attack humans and other animals, that wander too close to the fence perimeter. One of the biggest issues however, is that shock collars simply don’t work on 30% of dogs. That means for every 10 wireless electric fence installations 3 dogs simply run right through. Now, you might think to yourself that the dog may just need a more powerful shock, however some dogs get habituated to the shocks and learn that if they can tolerate the pain close to the fence-line, they can escape. Once they escape, they are rewarded with no more shocks. In this way, the dog learns that escaping is a good thing, whereas staying in the backyard is not. This is where the training is supposed to help, but when people see the $700 – $1000 price tag that is typically associated with shock collar training they opt out of training their dog which only makes the situation worse. The issue of using shock collars may be polarizing to some, however formal studies have shown that electronic shock collars can increase stress in dogs and reduce their quality of life. The results from Schalke’s study indicate that electronic collars are extremely risky to use even for the short term. Stress levels of the dogs were high after just 7 days, and were elevated as soon as they returned to the shock treatment environment. This is consistent with Polsky’s study, which show that dogs may associate the shock and stress they receive, with the environment itself indefinitely. So given all this information, what is the best way to contain your dog on your property? Traditional fences are a thousand times better than underground invisible electrical fences, however they are not designed to keep dogs from digging, chewing or climbing out of their enclosure. Not only are they ineffective, but they are incredibly expensive. Our most popular product, a DIY 5 foot tall 200 linear foot fencing kit, sells for $1,299 but the materials for a traditional wood fence would cost you well over $6,500. (Note both prices include materials only). A chain link fence is less expensive. The materials to put up a chain link fence over the same property would run you roughly $2,250. Additionally, chain link fences are like ladders to dogs and other predators. Most dogs can easily climb a traditional chain link fence. Our hybrid dog fence is strong and flexible. This flexibility is part of what makes climbing our fence virtually impossible from either side. The fence also feels like a net that dogs and other animals can’t climb it. Giving your dog an area where he can exercise in critically important for the health, happiness and behavior of your dogs. Owners that purchase shock collars think they are providing their dog with a safe area to play in – however, as we have shown, many dogs are actually harmed by this inhumane product. A Pet Playgrounds non-electric dog fence is a physical fence that is affordable, easy to assemble, and is the best way to keep your dog contained on your property. Don’t make the mistake of buying an invisible fencing system only to see your dog get out and then turn to other solutions. With Pet Playgrounds you can contain your dog affordably the first time. Still have questions? Call us at 1-800-985-9202 or chat with us online. Pet Playgrounds is the ONLY dog fencing system that has been field tested and approved by PETA. Use coupon code PETA to 5% on your oder. We’ll donate another 5% to PETA so they can continue to help animals in need. Trying to decide whether a Pet Playgrounds dog fence is the best solution for you? Here’s why a Pet Playgrounds non-electric dog fence is the best way to let your dog run free safely, humanely, and affordably. 1. Pet Playgrounds offers REAL climb, dig, and chew protection for any breed. The bottom of our fence is flared in 6 inches flat onto the ground and secured with a uniquely shaped kinked stake. This makes it incredibly difficult for any dog to dig under our unique fencing system. 2. It is nearly invisible. Stepping back just 10-15 feet makes the fence virtually disappear. View our gallery and check out how our fencing system looks from different angles, close up, and from far away. You can see just how easy our fencing system is installed even when installed in the most challenging of properties. 3. It’s the most affordable fencing option to protect and contain your dog. The average cost of our unique dog fencing system including installation is typically $9 per linear foot. Chain link fences can cost you $14 per linear foot (installed) because of the many landscape changes most people have to make and the incredible amount of posts that you need to purchase with traditional fencing systems. Even the cheapest wood fence would cost you $23 per linear foot. Check out our fencing calculator or better yet try our Easy Dog Fence Selector to find out the total cost of your Pet Playgrounds kit including the cost of installation instantly online. 4. It can be installed virtually anywhere – by anyone, on any terrain even over rocks, tree roots, and uneven land. Our non-electric dog fence can be installed on uneven or challenging grounds such as hills, streams, wooded or rocky areas due to the flexibility of the materials and its ability to use trees when possible. All materials last for 15-20 years and are virtually maintenance free. 5. Unlike wireless electric fences that might harm your dog, Pet Playgrounds fences keep other critters out as well as ensuring that your dog does not runaway. 6. Our non-electric dog fence kit has been field tested by PETA, and they loved it! We know you and your dogs will too! We shipped PETA a 5 foot dog fence kit with a gate. PETA found a family that had two dogs that were living on a leash. Like PETA, Pet Playgrounds believes all dogs deserve to run free so we were ecstatic that our dog fencing system was going to be used to improve the life of two wonderful dogs. 7. It’s the easiest way to let your dog run free and do his business without having to layer up and freeze every time your dog needs to go out! With our unique fencing system that attaches to your house you simply have to open your door. It’s sure getting cold out there, so don’t wait until it’s too late! With a mild winter in most of the United States (and even Canada) we have folks installing our DIY kits nationwide or benefiting from our professional installation services even in the midst of winter. Pet Playgrounds was founded in 2008 with the sole purpose of providing people with an affordable option to contain their dog in a safe enclosure, and protect them from deer and coyotes. Today, Pet Playgrounds continues to push the envelope with our unique materials, and assembly methods to create the perfect enclosure for your dog. We work with many rescue organizations and help them with their fundraising efforts. We have had our fence tested by PETA, and we are member of the ASPCA. Our love for dogs is what makes us wake up every morning. Recently a customer called us because their current fence was not able to keep their pit bull in their yard and they knew an invisible dog fence wouldn’t work either. Their pitbull would climb their fence as so many try to do. This customer had BOTH a wooden fence and a chain link fence, but these traditional fencing systems could not contain their large dog. This is because wooden and chain link fences become a ladder and assist dogs in climbing over a fence. Even though our fence is incredibly strong, it is also incredibly flexible. We utilize 11 different components to assemble our fence, but our 1000 pound break strength polypropylene mesh is what helps dogs like this pit bull stay on their property. The material is strong enough to bounce right back up after a hurricane, but flexible enough so that dogs are not able to climb it. The material feels more like a net than a ladder to a dog. Additionally, our dig guard which is assembled from our 1800+ pound galvanized rubber coated welded wire coated prevents this large dog from digging under as well. All our of kits come with REAL climb, dig, and chew protection and our kits also have the added benefit of keeping coyotes, deer, and other dogs out as well. Watch Lucy run free for the first time! We have a great dane/hound mix that just came into our rescue, named Lucy. We brought her to an adoption event Sunday but she was not settled down ’cause she just needed to get some energy out and to just run. It was suggested to bring her down the street to the dog park to let her run a little. Having personally just met Lucy the day before, I was a little leery of how she was going to behave with other dogs, and how they would behave with her, and not wanting to be responsible for something not going well, I took her five minutes further away, to my dog park! So, this is the video of her going off leash for the first time under our watch. She also met my pups for the first time… in a nice safe environment. Interested in adopting a dog from Companion Pet Rescue & Transport? View all the dogs that need a forever home! Intersted in assembling your very own personal dog park in your backyard? We have DIY kits and professional installation services that are perfect for every breed and for every property type. Once you have purchased your Pet Playgrounds non-electric dog fence check out our full line of practice and competition quality dog agility products. Don’t forget to use code CPR5 to save 5%. We’ll go ahead and donate an additional 5% right back to Companion Pet Rescue as well. Haven’t seen Sandy’s review of her Pet Playgrounds non-electric dog fence? Watch it now! Pets for Vets saves animals while providing therapy for suffering veterans. Donate today. Pets for Vets believes our country owes military veterans a debt of gratitude. Our soldiers have been brave but many of them have returned with physical and emotional injuries that have made it difficult to transition back to civilian life. Some estimates state that as many as 20% of returning military veterans suffer from Post-Traumatic Stress Disorder (PTSD). Their goal is to help heal the emotional wounds of military veterans by pairing them with a shelter animal that is specially selected to match his or her personality. Professional animal trainers rehabilitate the animals and teach them good manners to fit into the veteran’s lifestyle. Training can also include desensitization to wheel chairs or crutches as well as recognizing panic or anxiety disorder behaviors. It’s win-win. Are you in Connecticut? Are you looking for a new dog to adopt and make your home their forever home? Then check out the adoption event hosted by Homeward Bound on November 8, 2014. Pet Playgrounds has donated a temporary fence for Homeward Bound so every dog there can run free! When you adopt your new best friend tomorrow make sure that he can run free. Dogs should not live on a leash, and after giving your dog the love he deserves, investing in a new Pet Playgrounds fence is one of best things you can ever give your dog. When you order your new Pet Playgrounds non-electric DIY dog fence make sure to use coupon code Homeward to save 5% on any kit. Not only will you save 5%, but we’ll donate another 5% right back to Homeward Bound CT so they can help more dogs in need. Want to know what dogs are going to be available to adopt tomorrow? Check them out right here! All of our DIY Dog Fence Kits, whether they are 4 foot, 5 foot, or 6 foot come with REAL chew, dig, and climb protection, however there are some dogs (and some breeds) that are particularly challenging to contain. This is when you would select a MAX strength 6 foot dog fence kit. Our MAX strength dog fence kits have a third outside layer of 19 gauge steel vinyl coated welded wire netting that makes chewing virtually impossible. When these three materials are combined it creates a MAX strength dog fence that can contain even the toughest of dogs. Our standard dog fence can withstand up to 2,900lbs of pressure per square inch (PSI). Most chain link fences can only withstand 1,000 PSI, Wood fences 550 PSI and Vinyl withstands even less! We’ve seen falling trees that couldn’t even break our fence. It’s THAT Strong – but, if you have a relentless canine that will spend hours chewing, ripping, pulling and tearing at anything, our MAX STRENGTH fence is exactly what you need. We added a 19 gauge steel vinyl coated netting material to our existing layers of fencing to provide the ultimate in containment. Our 19 gauge STEEL vinyl coated welded wire netting material can be attached to existing fencing (such as post and rail) or can be installed independently with the components included in our MAX Strength Dog Fence Kits. It keeps other critters out such as: coyotes, deer, other dogs, snakes, and small rodents. It is effective, humane and safe to use anywhere. You won’t harm your dog or other animals that attempt to enter your yard. Vulnerable trees, plants, shrubs and landscaping will stay protected from small and large wild animals – especially from nuisance deer. Deer ticks can carry Lyme disease, Tularemia, and Rocky Mountain Fever. Our MAX Strength Dog Fence Kit serves a dual purpose by stopping deer from entering your property, and also limiting the amount of ticks that can infect your dog, other pets, and even family members. We have been installing this product for years, and we now are able to offer DIY Kits to the United States and Canada. To celebrate the announcement of this new product line, we are offering FREE SHIPPING for every order that is shipped within the continental United States. Take advantage of this incredible limited time offer. Every dog owner dreams of the day that they can command their dog to do tricks, come when they are told, and simply be well behaved off-leash. This is not an easy process, but a non-electric dog fence from Pet Playgrounds can make this simpler. Many trainers recommend training a dog within a safe enclosure which will help alleviate the barrage stimuli that can hinder the training process. If you want your dog to learn to respond when they are off leash, start by training them in a safe enclosure, and gradually increase the time that they are allowed to spend off leash. Like with most things, you need to walk before you can run and this means that if your dog doesn’t know “the basics” like sit, stay, or down you’ll need to start there. Just remember that if you want your dog to learn to respond to you when they are off leash, you need to start by training without the aid of a leash in a safe enclosure. This may seem obvious, but many dog owners spend weeks in dog classes working on commands like sit, stay, down, and come with our dogs on a six-foot leash but when they snap off the leash, their dog may act as if they’ve never been to training class. Unfortunately, on-leash training – while valuable for on-leash behaviors – can’t prepare either of you for the challenges of the off-leash experience. This is partly due to the fact that people often and inadvertently use physical cues such as a slight pressure on the leash to help the dog know what they want. When the dog and handler lose that added signal, their communication falls apart. Of course, you can’t simply head out to a stimulating environment and expect your dog to behave as he would on leash in a quiet, controlled atmosphere. Start at home in your fenced in yard. When your dog can easily and happily move through a repertoire of off-leash skills in your yard then you can move your training to a fenced in park. As your dog becomes more and more reliable working off-leash he will find it easier to respond to you, even in new environments. Positive reinforcement training and the use of a reward marker, like a clicker or the word “Yes!” are essential tools for training off-leash. Reward markers let your dog know that he got it right and the reward is coming, even when he’s 20, 30, or more feet away. A dog who is appropriately rewarded for his efforts will quickly learn to listen and respond off leash. Your dog is capable of amazing things, but you simply have to know how to train him to do them. Before you can teach your dog how to run and catch a frisbee, you should teach your dog to know how to perform a “down” on cue when he’s near you. Gradually increase the distance between you and your dog as you ask for the down. When you are far apart, it may be inconvenient to keep up a liberal reinforcement schedule for her successes, but make sure you do. You want her to be highly motivated to perform the down as quickly as possible. You may not want your dog to catch a frisbee, or do other amazing things but we all would love to enjoy a walk with our dog running free by our side. It will take some time, but it can be done. Keep in mind that every dog has its limits. Some dogs have special fears that may compromise their off-leash safety – for example, some dogs will run blindly at the sound of anything that sounds like a gun, including a distant backfiring car. Others may have strong drives that can lead them astray, such as the fresh scent of a pheasant for a hunting dog, or the sight of a rabbit running for a sight hound. Get to know your dog’s limits, understand what motivates him, and anticipate when and where you may have problems. You may be able to set up special training situations to work through some challenges. These wonderful dogs were trained by Stephanie Williams of Pawsitive Partners in Connecticut. They can help create a cooperative owner-dog partnership through positive reinforcement training. For more information visit their website at www.pawsitivepros.com or call them at (203) 530-0122. Stephanie selected a Pet Playgrounds non-electric dog fence for her yard, and she loves it! Use the coupon code PAWSITIVE at checkout to save 5% on your non-electric dog fence kit! PETA field tested our non-electric dog fence kit and loved it! PETA field tested our non-electric dog fence kit and loved it! We shipped PETA a 5 foot dog fence kit with a gate. PETA found a family that had two dogs that were living on a leash. Like PETA, Pet Playgrounds believes all dogs deserve to run free so we were ecstatic that our dog fencing system was going to be used to improve the life of two wonderful dogs. Scroll down to check out the pics of PETA installing and testing our unique DIY dog fence system for these two wonderful dogs. PETA loved our product, and has now included us in their PETA Business Friends Program. We couldn’t be happier. In fact, we are ecstatic. Why? Because the authority on humane treatment for animals has professed their love for our product. Our product is the most affordable and most effective way of letting your dog run free as well as well as protecting your dog from running away and being attacked from other predators (like coyotes, or other stray dogs). Use coupon code PETA and save 5% off of the purchase price of your DIY non-electric dog fence kit. When you use this coupon code, we’ll send an additional 5% right back to PETA to help animals in need. Check our our new Pet Playgrounds Easy Dog Fence Selector and find out what kit works best for you and your dog. Have questions? Call us at 1-800-985-9202. Don’t worry. We’re dog people! We’ll answer any questions that you have and point you in the right direction. See how easy it is to install a Pet Playgrounds DIY dog fence. Pet Playgrounds is the FIRST dog fence company to accept Bitcoin. Pet Playgrounds is the first online retailer of DIY non-electric dog fence kits to embrace bitcoin, accepting payments in the digital currency here in the U.S. and now in Canada. Anyone in the US or Canada can now use the digital currency to purchase a DIY dog fence kit. An option that was never available before today. Many questions hover over the future of bitcoin, a new type of money overseen by software running on across a vast network of machines. It’s still unclear how the governments of the world will regulate use of the currency. But it continues to evolve, and Pet Playgrounds has decided to jump in. Pet Playgrounds has partnered with BitPay to collect and convert all funds directly into US dollars at the time of purchase. Accepting credit card payments is rather expensive, due to steep fees from third-party processors. Pet Playgrounds still pays BitPay to handle these transactions, but these fees are significantly lower even without accepting bitcoins directly. So why has Pet Playgrounds decided to accept bitcoin? The potential to harness the technology that lies at the heart of the Bitcoin system, a public ledger called a block chain, is a totally new way of thinking about transactions. It keeps records that are decentralized and keeps users semi-anonymous while making their transactions public. Of course the technology aspect is only part of it. From a financial perspective Bitcoin can reduce credit card processing fees to less than 1 percent, which is much less than the standard 2-5% that is typically charged. Also, because people can pay businesses in Bitcoin without divulging personally identifiable information (names, billing addresses, etc. ), they enjoy a level of identity-theft protection that credit cards simply can’t offer. Whether or not bitcoin will last forever is irrelevant. The fact that small businesses like Pet Playgrounds are adopting the technology means more people will utilize the technology, and for now that is all that matters.